BUFFALO, N.Y. -- The Rochester Plates, starving for that first win, finally broke through Thursday night in Buffalo. 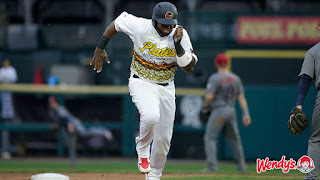 The Plates won their first game ever, beating no other than the Buffalo Wings, 3-1, in the first game of a four-game series at Coca-Cola Field. Rochester (30-33) had gone 0-4 as the Plates since debuting the moniker back on August 10 of 2017. On Thursday, the Plates used a three-run first inning and strong start from Adalberto Mejia to win the food fight. Mejia earned his post-game Plate allowing just one run on four hits over six innings to pick up his second win of the season. Nick Anderson followed with two scoreless innings before turning things over to John Curtiss who worked a 1-2-3 ninth to secure the save. The Plates got an RBI double from Chris Carter and two-run single from Kennys Vargas in the first inning. It was the first time Rochester has scored at least three runs in an inning since a four spot in the fourth inning on May 30 at Durham. Zack Granite and Vargas each had multi-hit nights. Rochester has now won back-to-back games for the first time since a four-game winning streak May 29-June 1. The Plates and Wings continue their series on Friday night at 7:05 pm. Rochester will send righty Zack Littell (1-2, 3.38) to the mound opposite Sen Reid-Foley (1-1, 6.75). GAME NOTES: The Plates grounded into a season-high four double plays…Rochester improved to 20-12 on the road this season, the best mark in the league.